Demo | Moyes Malibu 2 188 silver under/top surface and accented yellow/red outline with speedbar. Originally designed for beginner and intermediate pilots, the Malibu was soon adopted as the perfect “dune-gooning” wing and warmly welcomed by experienced pilots, due to its exceptionally slow speed and quick roll handling performance. 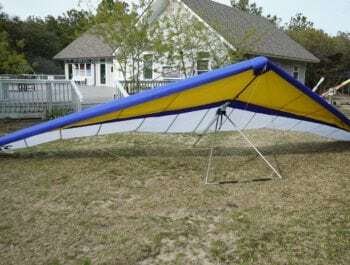 Excellent Beginner/Novice glider for pilots in the weight range of 177- 277lbs.